Episode 101 — Beware the Eyes That Paralyze! It’s the first episode after Episode 100, and the first episode of the new weekly format! 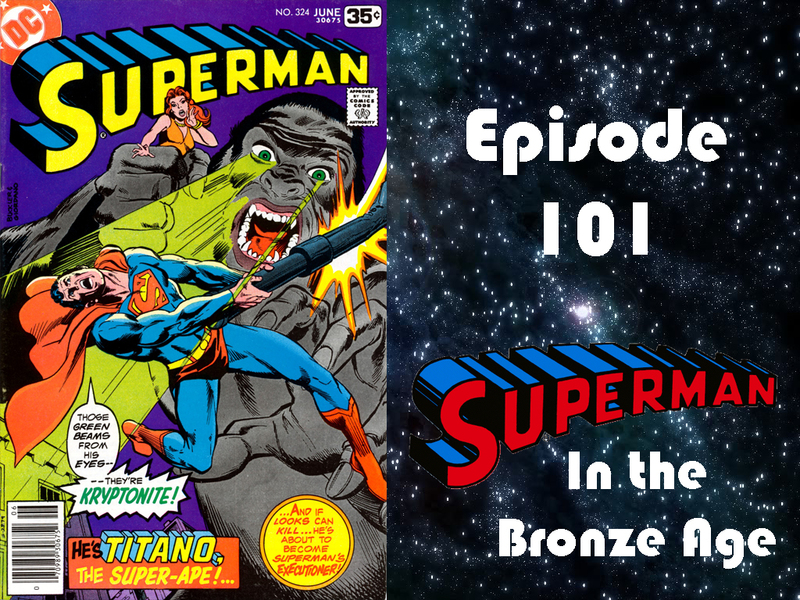 And to start things off, Superman has to take on both the Atomic Skull and Titano! And, like this issue, every sentence ends with an excalmation point! Woot! If you would like to comment on the show or contact us, you can to so in the following ways: you can leave a comment below, you can leave a post on our Facebook page or you can email us here. You also private message us or leave a comment at the posting on the Superman Homepage or our Tumblr page. Hi, Charlie! (no more just Charlie jokes) Great episode as always. It may be a little harder for me to write an email for every show now, since it’s weekly now, but I sure am going to try. A big Thank You for you from me for plugging my future podcast. I’m getting things organized in my head and on paper for a promo or two and my “Pre-Episode 1” show. It shouldn’t be long now until “The DC Comics Presents Show” hits the internet. I don’t have Superman #324 yet nor #325, but I have #326 and #327. #324 sounded like a nice comic book. That Lana sure is a sneak, huh? (was that the word you couldn’t say on a “family friendly” show?) And it’s always nice to see Titano. The top surprise for me was an appearance of the Supermobile. You and I have discussed the mobile a few times through email. I have always loved the idea of it and it sure came in handy this time. I can’t wait to get an actual copy of this comic so I can go through it again. One last thing before I go. During one of your email segments a while back, you suggested to me that after your show is over that I might start over and listen from the beginning. You might have been joking, but I think I am going to do just that. My Superman comic collection is better now than when I started listening, so I might have more shows where I can listen and follow along at the same time. I’d also be curious when I started emailing you and count how many I have sent you. Well..that’s all from me this time.